« Oh how times have changed. Day 5 of the WoW drought. Home internet status – still down. Reason – Undersea line maintenance, ISP screwups, DNS errors, me hitting my router with an axe. It’s gone all pear-shaped here at mission control. My fingers instinctively curl into the wasd-position every time I get close to a keyboard. My thumb searches for the autorun button on the side of my mouse. The problem is that mission control is not my trusty comfy chair at home but rather my “ergonomic” (read: back-breaking) chair at my desk at work. I try to cram as much personal internet time (my various browser games, guild forum maintenance, personal mail, etc) in without drawing attention to myself but it’s just not enough. At night I get home, sit at my desk, fire up my pc and stare at the Chrome icon on my desktop. I even catch myself clicking it, launching a string of my favourite sites and then staring at dismay at the “Page cannot be displayed” messages. I have the good sense not to even glance at the WoW icon… I just can’t take the disappointment. So I’m bored beyond belief, what to do? Oh wait, I have an Xbox gathering dust in the corner. And didn’t my brother’s girlfriend buy him Final Fantasy XIII? Time to find my controller and get playing! Stunning graphics as what the FF saga knows best. Wow… just wow. I haven’t played a FF title since 6 or 7 on the original playstation and even back then it was groundbreaking. But now it looks a thousand times more awesome. I do the first “big” fight. Fairly easy stuff but I’m still in the learning curve right? More pretty stuff fly past. I find a save point with the most useless shop ever attached (it does improve eventually though). Some more cutscenes and pretty stuff. 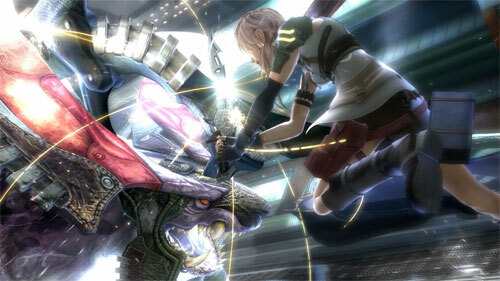 Ok, it’s day 3 of playing Final Fantasy XIII and I’ve progressed a fair amount. At first the combat system really irritated me. I mean why even give you the option of fighting if the only thing you ever do is select the autocombat option? Combine that with the fact that the only combat/action sequences are broken up by cutscenes lasting 15 times your playtime and you start getting the feeling that they might as well have made it a movie and saved you from having to push the green button every few minutes. Soon however things started changing. Suddenly your characters gain roles, either forming the tank/dps/heal trinity, a full nuke squad or whatever you choose in between. They also start gaining the immense powers as shown in the previous titles. Much of the combat is still automatic but you start feeling like you’re a bit more in control. I did prefer the old turn-based style of the older titles but the newer system started growing on me. Different paths start opening up on the scenes where you control your character movement too. The “talent tree” is as close to pointless as one can get though. Your options are so limited compared to normal RPGs and you feel that an auto-advancing system would have saved more time. Gear upgrades are limiting as well and I’ve yet to find a use for the trash you pick up from mobs. I’m a fan of the genre, I really am. I enjoyed the ones I played ages ago and still boot up the occasional FF2/3/4 on an emulator now and then. This one however left me doubting after the first hour though. My interaction with the game felt more like an afterthought than actually playing. As the hours stacked up it just got better and better. I don’t mind the cutscenes wasting all that time as much anymore. I can live with the combat system and am actually starting to find it exciting. So in the end I do approve of the game. For a fan of the series/genre it’s a must. For a newcomer it offers something unique and captivating… if you stick through the boring bits in the beginning. I still miss WoW though. This entry was posted on April 29, 2010 at 11:32 am and is filed under Bored!, Final Fantasy, Life. You can subscribe via RSS 2.0 feed to this post's comments. You can comment below, or link to this permanent URL from your own site.